Dr Jeannie Constantinou, Postdoctoral Teaching Fellow, Theology, and Religious Studies, University of San Diego and AFR podcaster (Search The Scriptures), speaks with Kevin about all things biblical, and how the Orthodox Tradition relates to and interprets the Holy Scriptures. Part 5 of Pres. Jeannie's study on the resurrection of Christ. Dr. Constantinou continues her Introduction to the Bible, this time focusing on the Book of Numbers. 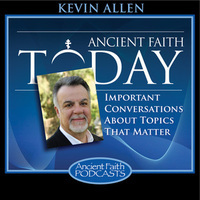 Mr. Kevin Allen: Welcome to Ancient Faith Today, Orthodox Media’s live listener call-in program on contemporary issues, through the lens of the tradition of the Eastern Orthodox Church. I am very pleased you are with us this evening. We’re streaming live right now, and we’ll be opening the lines and taking your live calls in about 15 minutes. The call-in number, as the announcer mentioned is 1-855-AF-RADIO. That’s 1-855-237-2346. Our chat room is now open, being moderated by Fr. John, and that’s ancientfaith.com/ancientfaithtoday, if you want to listen and chat. You can also find us on Facebook, and while there, click “like.” We’ll appreciate that, and you’ll get our AFT updates. Our sponsor tonight is museum-quality Legacy Icons. Check out their website at legacyicons.com. In addition to Old World quality and beauty, Legacy Icons have a lifetime guarantee against fading. Tonight all of our live callers’ names will be entered into a drawing for an 8"x10” icon of St. Seraphim of Sarov from Legacy Icons. I’m jealous. We’ll announce the name of the lucky winner at the end of the program. Our topic tonight is one that is going to be of great interest to many. For many Christians, the Bible is the inerrant word of God, the sole and final authority on matters of faith and doctrine. And, of course, there are many ways to interpret and understand the Bible, and this has led to literally thousands of heresies, variant doctrines, schisms, and splits within Christianity. Tonight our topic is the Eastern Orthodox approach to the Scriptures. I’ll be speaking with my guest, Dr. Jeannie Constantinou, about a range of questions, from how the early Church Fathers interpreted the Scriptures to whether we view the Bible as inerrant, and what inerrancy actually means to modern textual criticism, the development of doctrine, Bible study groups, and reading the Bible devotionally. Again, we’ll take your calls in about 15 minutes, so we can lay a bit of a foundation first. If you call before then, just please be prepared to listen while on hold until we can get to you. If you get no answer tonight, I’m expecting many calls, although [we’re] competing with the Oscars, but thank God for that. That’s because lines will be busy. Keep busy, and our call screener will get to you. And now to my guest. Many of you know Jeannie Constantinou from her Ancient Faith Radio podcast, Search the Scriptures. Jeannie holds a Master’s degree in theology from Holy Cross Greek Orthodox School of Theology, with a specialization in patristics, and a Master’s of theology from Harvard Divinity School, with a specialization in New Testament [studies]. She also has a Juris Doctorate from Pepperdine University out here in southern California, and has practiced law as a member of the California bar. She has a Ph.D. in theology and wrote her dissertation on the Book of Revelation in the ancient Church of the East. In addition to writing, podcasting, and lecturing, she is an adjunct assistant professor at the University of San Diego in the Theology and Religious Studies Department, where she teaches Biblical studies, early Christianity, and Medieval Church. She’s also a priest’s wife; she’s Presvytera Jeannie Constantinou. Her new book, Guiding to a Blessed End: Andrew and His Apocalypse Commentary in the Ancient Church, which I am actually looking at a beautiful pre-published copy of, will be out in March, on March 6, and is available—or will be soon—on Amazon. She also translated for the “Fathers of the Church” series Andrew of Caesarea’s Commentary on the Apocalypse. Dr. Jeannie Constantinou, it’s great to have you on the program this evening. Dr. Jeannie Constantinou: Thank you, Kevin. It’s nice to be here, and before we go any further, I’d like to thank you for all the fine work you’ve done in your podcasts for AFR. I’m one of your fans. I listen to your podcasts, and I really appreciate all the time and thoughtfulness you put into these wonderful interviews, so thank you very much, and for having me tonight. Mr. Allen: Thank you, and with your background, I just want to say I’m not worthy! So thank you. Dr. Constantinou: Definitely not true. Mr. Allen: Jeannie, let’s begin with the Hebrew scriptures, because we’ve got a lot of ground to cover tonight, and I want to get to it even if we have to go a little bit long. Let’s start with the Old Testament, or the Hebrew scriptures. The first translation of the Hebrew scriptures into Greek, which was the common language of the Roman civilization at the time, is the Septuagint version, sometimes known as LXX to our listeners, written approximately 150-250 B.C. It continues to be the authorized version of the Hebrew scriptures that we Orthodox use liturgically. However, and here’s the big question—I’ll phrase it—the Old Testament, or the Hebrew Bible that is considered authoritative today by Jews and Protestants is not the Septuagint, but it’s the most recent, more recent translation, rather, called the Masoretic text, circa 7-10th centuries after Christ’s death. So the Masoretic Old Testament or Hebrew text was based on translations from Hebrew manuscripts, original Hebrew manuscripts, that are at least ten centuries later than that which was used in the Septuagint. So here’s my first question: Why do the Orthodox churches use the Septuagint translation as the official version of the Old Testament, liturgically, when Jews and Protestants use the later and more recent Masoretic version? Dr. Constantinou: Okay, Kevin. This is, of course, a very common question. The short answer is that we use the Septuagint because the Septuagint was the Scripture of the early Church. The Jews, of course, standardized their Bible much later than [that,] quite a long time after the start of Christianity. The Protestants follow the Jewish tradition because Martin Luther, when he started the Protestant Reformation, believed that they should follow the Jewish tradition because if the Old Testament is supposed to be the Hebrew scriptures, then really we should be following what the Hebrews have that’s in the canon and the text. But remember the Protestant Reformation was a rejection of the Catholic Church and of the traditions of the ancient Church. So people who want to be the closest to what the Church was doing in the early Church should not be really looking at the Hebrew text, but looking at the Septuagint, because far more Jews were speaking Greek and using the Septuagint at the time of the early Church than were using Hebrew. There were millions of Jews in what we call diaspora. We call them Hellenized Jews or Hellenistic Jews. These were Jews who did not know Hebrew. The Jews who used and knew Hebrew were the ones who were living in Judea and maybe Galilee, and those [were] of [a] small minority of Jews in the world. Philo of Alexandria says that there were one million Jews in Alexandria, Egypt. That’s probably an exaggerated number, but there were millions of Jews throughout the Roman Empire—in Babylon, especially in Asia Minor, and Egypt, in Greece, in Rome—and those people used the Septuagint. That’s why when Christianity began, it began in the Jewish synagogues, and those people were using the Septuagint, so the Church simply continued that practice. Mr. Allen: And is it true—correct me where I’m wrong—that most of—or maybe all of; I don’t know—the quotations of Hebrew scripture in the New Testament came, not from ancient Hebrew manuscripts, but came out of the Septuagint version of Old Testament Hebrew scriptures? Dr. Constantinou: Yes, especially that is the case with most of the New Testament. When they’re quoting from the Old Testament, they’re quoting it [from] the Septuagint version. The apostles didn’t find anything wrong with the Septuagint. They didn’t say, “Oh, we can’t use this, because it’s not Hebrew.” That was the common Bible of the Jews for 200 years before Christ. Those were their Scriptures. And the thing is that the New Testament is just saturated with words and images from the Old Testament. Today, if I quote a Bible verse at you, you recognize it as being from the Bible, especially if I quote it in the King James Version. We all know those words; we know the terminology. When the authors of the books of the New Testament were writing, their minds were infused with the language and the images and the terminology which had been used among Hellenistic Jews for 300 years. We’re just continuing that. Actually, our practice of using the Septuagint is much more ancient and is more in keeping with the common Jewish tradition, we could say, at the time the Church began. People think of the Septuagint as belonging to the Church, but it was Jewish for hundreds of years before it became identified with Christianity. Mr. Allen: Why do Jews reject it? I’ve heard that they actually rounded up and destroyed the Septuagint versions once they brought the Masoretic out. Was it because the language of the LXX or Septuagint was particularly prophetic? I mean, what was the reason for the rejection of the Septuagint by the Jews? Dr. Constantinou: Okay. Before we go any [further], I want to say a couple of things. First of all, generally speaking, a translation is not as good as the original. A translation is not to be preferred over the original. But with the Septuagint, what we have is a translation that was made long before the Hebrew text was standardized. Dr. Constantinou: So here’s what happened. Now, today we expect everything to be uniform and standardized. We have rules, and everything is identical, because we live in an age of mechanization. But people used to copy the books of the Bible by hand. All of the Bible exists in ancient manuscripts, handmade copies. No two copies were exactly alike, and that was for Hebrew, too, not just for the Greek. So the Septuagint is the translation of Hebrew copies of the Bible that existed long before Christ. The Hebrew was not uniform in all the copies. That’s simply impossible to do. Mr. Allen: We’re going to talk about this a little bit later, when we talk about textual criticism. I want to get back to this. Dr. Constantinou: Okay. So the point is that there was no uniformity even with the Hebrew at the time the Septuagint was made. That’s why the Septuagint in many places reflects a more ancient tradition, a more ancient wording of the Hebrew, and we’re going to talk about this more, I’m sure, in later questions. Mr. Allen: Why did the Jews reject it? Dr. Constantinou: “Why did the Jews reject it?” That’s what I wanted to get back to. I’m sorry I got a little bit afield. Here’s what happened. When Christianity first began to move, when the Jesus movement— We can’t even really call it Christianity, because it wasn’t a separate religion at the time. Sometimes in scholarship we call it the “Jesus movement.” Christianity was not separate from Judaism. It was a sect within Judaism. All the first followers of Jesus were Jews, and these were Jews who believed that the Messiah had come. There was nothing that was different about them from other Jews. They just believed the Messiah was Jesus. So they went out, spreading this message, and there were huge arguments in synagogues over whether Jesus was the Christ. Imagine you know the Book of Acts, how Paul went out, and other apostles the same way, would go first to the synagogue. There they would gain a few converts, a few people who were convinced. What were they using to preach that Jesus was the Messiah? The Septuagint, because that was the Bible of the people. The Jews in the diaspora did not know Hebrew. So they preached and they gained a few converts. They created a separate community of Jewish Christians, Jews who believed that Jesus was the Messiah. This, as I said, created huge conflicts within Judaism. The fact is that the arguments for Jesus being the Messiah who fulfilled—how do you prove that he’s the Messiah?—he fulfills the prophecies. The arguments are very strong; they’re very compelling, but some Jews could not get over the Cross, for example. They rejected Jesus as the Messiah. After a while, those two groups of Jews could not be reconciled, and the Jews who rejected Jesus began to identify the Septuagint with the Church. Dr. Constantinou: So that’s why they reject it: because it’s their product. The Septuagint is a creation of Jewish translators. They reject it. Why? Why did they reject it? They identify it with [the Church], and here’s something else: it’s not just that they identify it with the Church, but the arguments were so strong that they couldn’t really respond to them, so they said, “Listen, if you want to argue about Jesus and Messiah, you have to use the Hebrew. You can’t use this Greek translation.” So it was an easy way for them to dismiss Christian claims, because most Christians, as most Jews, did not know Hebrew, so they couldn’t debate them using the Hebrew. Mr. Allen: Oh, that’s interesting! Dr. Constantinou: So it’s an easy way to be dismissive of Christian claims and say that’s a flawed translation. Mr. Allen: What about reliability and accuracy? Do modern biblical scholars consider the newer version, the Masoretic, more reliable and accurate than the Septuagint, for example, in light of discovery of ancient papyri manuscripts like the Dead Sea Scrolls and so on? Dr. Constantinou: It’s very difficult to say. The Septuagint is not necessarily—and I’m giving you kind of a lawyerly answer—inaccurate. Hebrew is not necessarily more accurate. It’s very hard to tell, because the Septuagint is a translation that predates the standardization of the Hebrew words. So the Hebrew words were not standardized. There was no uniformity. There were a lot of different variations in the way something was expressed. Since the discovery of the Dead Sea Scrolls, that has actually confirmed that the Septuagint is accurate in many places. It is not a distortion of the Hebrew, but it reflects a genuine earlier version of Hebrew that has since been lost. We know that because we found Hebrew books that match with what the Septuagint says in Greek. So it’s clear that the Septuagint is not a kind of aberration. In many ways it preserved earlier, more ancient Hebrew traditions. Mr. Allen: The Masoretic text, for an example, changes words like “virgin” to “young woman.” Was this part of the strategy behind the Masoretic, in your opinion, to kind of water down some of these words that were used to prove the Messiahship of Christ, if you will? Dr. Constantinou: In a way, yes, but before we even say that, I want to make one thing clear. We can prove that Jesus is the Messiah with the Hebrew Bible, too. When the apostles went outside on the day of Pentecost and started preaching to the Jews in Jerusalem—they left the upper room—St. Peter starts preaching. He’s preaching in Aramaic, and he’s quoting the Hebrew scriptures. And 3,000 people were converted that day and the Church grew in leaps and bounds in Jerusalem. We don’t need the Septuagint version to prove that Jesus is the Messiah. He’s the Messiah in Hebrew just as well. To answer your question, here’s what happened. The Jews did not have—forget about just the different words—a standard canon. Think about this, and this is hard for us to imagine, because we, again, think that everything came as a group, but the Bible did not exist in one volume. The Bible existed as separate scrolls or collections. At the time of Christ, this is the time when the early Church began. The only books that all Jews agreed on as Scripture was the Torah, and that’s just the first five books. Think about this. So the Pharisees accepted four more books that they call “Prophets.” Those are: Joshua, Judges, Samuel, and Kings. Then the prophetic texts, the major prophets, and what we call the minor prophets. They accepted a few more books, the Pharisees, but the Sadducees did not. The Sadducees are not some little fringe group. They were major power-players; they were major, very influential Jews. They rejected all books of Scripture except the Torah. So there was no consensus even about the canon. What happened is: Christianity begins, the Church is up and running, most Jews have a wider canon, more than just the Torah. Think about this: The Psalms were not considered Scripture, and yet our Lord quotes them as Scripture in the New Testament. So there was no set canon. The canon is the list of books. What happened is the Church began, and then you have the Jews beginning to standardize the text and standardize, decide on, which books should be considered Scripture. But that doesn’t happen until at least 200 years after the Church is already in existence. Mr. Allen: ...Wisdom of Solomon, etc.? Dr. Constantinou: Yes. There was no set canon of Scripture. It was very ambiguous what books, because the Bible did not exist in one volume. They’re separate scrolls. Every book was separate. What one person considered to be Scripture, another person may not, but we know for certain that the Jews in diaspora, the Hellenized Jews, they had a wider canon. They recognized more books than pretty much the Jews in Palestine. However, those Septuagint books that eventually did not get accepted by the Palestinian Jews in the Hebrew canon, those are found in the Dead Sea Scrolls, too. So we have Septuagint books in the Dead Sea Scrolls—in Greek, by the way, some of them. The Jews who were pretty conservative at Qumran, they also knew those books and were reading them. Mr. Allen: Okay. Thanks for shedding light on that. I don’t want to spend too much more time on Masoretic-Septuagint, because we’ve got a lot of ground to cover. Jeannie Constantinou, we have four gospels encased in gold on the holy altar, and this seems to suggest to some that we hold the gospels—Matthew, Mark, Luke, and John—in higher esteem than the other books of the Bible. For example, we never read the Book of Revelation during the Liturgy. What does this suggest about the other books, the epistles? We do read the epistles, but usually it’s a person—a deacon or a layperson or a subdeacon—that reads it. What does it suggest about these books? Dr. Constantinou: The gospels definitely are treated differently in the Orthodox Church. Very simply, they contain the words and the life of the Lord. So they are in higher esteem. He’s the one that we’re following, so, definitely, they are treated very differently, but other than that, we don’t really rank books in the Orthodox Church, which books of the Old Testament have more authority. The Revelation is a kind of case on its own. It’s not in our lectionary, but definitely you’re right about the gospels. Mr. Allen: And you’ve written and spoken extensively about the Book of Revelation, so we’ll probably not take so much time on that one. Can you think, though, of any doctrines that would be affected if we didn’t include the deutero-canonical texts in the Bible? I’m thinking, as you know, the prayers of the dead in 2 Maccabees 12. Dr. Constantinou: No. First of all, that’s not doctrine. That’s a practice; that’s a Christian practice among the Orthodox Christians. But I know what you’re talking about. We wouldn’t probably call that a doctrine. Here is what I would say. I would say that, no, there’s nothing that— First of all, the Church does not rely on the Bible for its doctrine. We don’t rely on the Bible, because the Church came first. First of all, we’re talking about Christian texts. We’re talking about the New Testament. That came after the existence of the Church, so the Church does not need to find justification for its beliefs within the Bible. The Bible is the written form of apostolic tradition, and before it was written down, it was passed along orally. It was passed along orally. What we know about Christ we know—initially, the Church knew from the oral tradition. About the prayers for the dead, that was a practice in Judaism at the time of the early Church. That’s why the Church does that today, and we know it was a practice, because it’s reflected in the Maccabees. The Jews were praying, and actually until fairly recently—I had to research this for one point—until the 18th century, most European Jews said prayers for the dead. A lot of Jewish customs and practices were rejected because they were identified too much with Christianity, but in the early Church they prayed for the dead because the Jews were praying for the dead. Mr. Allen: But they still have a prayer. It’s called the Kaddish. Dr. Constantinou: Yes, that’s a glorification of God, however. That’s not a prayer for the repose of the soul. I’m talking about prayers for the repose of the soul. Yes, the Kaddish is praises for God, basically. Mr. Allen: Speaking with Dr. Jeannie Constantinou and our subject is the Eastern Orthodox approach to the Bible. We’re going to open the phone lines: 1-855-AF-RADIO, 1-855-237-2346. We’ll take your calls, and we’ll get your names posted for a drawing for the icon of St. Seraphim of Sarov. Dr. Constantinou: Okay, well, we would say the reason why I’m saying that is because if we were to say that our Christian doctrine comes from the New Testament, for example, then what that means is that the Church existed and they had to wait around until those books were written to find out what they believed, and that’s ridiculous. The Church knew what it believed about Christ before the books of the New Testament were written. Mr. Allen: The rule of faith. Dr. Constantinou: When you take something like the apostles… The apostles were with Christ for three years. They learned, they knew who he was. That’s doctrine. Who was Jesus? They found out about the virgin birth and they experienced the resurrection and his miracles and fulfillment of prophecies and his teachings. All of those things were passed along orally. Now, the Scripture supports doctrine, but we don’t have to have it, because the Church pre-existed the Bible, and the Church had doctrine. Mr. Allen: For an example, the fully formed—correct me where I’m wrong—doctrine, say, of the Holy Trinity was actually developed in the early Ecumenical Councils as a reaction against heresy. You don’t really see that doctrine fully formed in Scripture, do you? Dr. Constantinou: No, you’re right about the articulation. If that’s what you mean, that’s different. The fact is that the Church already knew what it believed, and then it had to at a later date articulate with specificity, with the exact theological language, what it believed Christ to be: one Person in two natures, human and divine; the Trinity. Obviously, we have lots of references to Trinity in the New Testament, but that wasn’t invented by the writers at that moment. They’re passing on already what they knew. Jesus says to the apostles, “Go out and baptize, in the name of the Father, Son, and Holy Spirit.” That’s an oral tradition. He said that to them orally, and they were doing that until Matthew writes it down at a later date. Matthew’s not transcribing and publishing right after the Lord said it. That’s what I’m trying to say when I say it doesn’t depend upon the Bible. However, our doctrines are supported by the Scripture, but there’s something else. There’s something else: that all heretics use the Bible, too. Heresies are in the Bible. So what mattered was not simply was that it’s there in the Bible, but it was how the Church understood those teachings; what did they mean. So it was the continuity with the early Church’s understanding of those things that mattered, not just that it’s in the Bible, because we can find all kinds of things in the Bible. Mr. Allen: That’s why we have 25,000 denominations, I suppose. Dr. Constantinou: We could make a case for anything in the Bible, and people do. So that’s why we can’t say that the Church derives its doctrines from. The doctrines are there. They support what the Church has always taught. Ultimately, the Church has its doctrines from the Lord, and especially from the Holy Spirit at Pentecost. This is very unique for the Orthodox. There is no such thing as continuous revelation in the Orthodox mind. The Church received the fullness of the faith at Pentecost, once and for all. Mr. Allen: So no development of doctrine, per se. Dr. Constantinou: No. The fullness of the faith was received at Pentecost, and there’s a reason for this, and my husband taught me this a very long time ago, and I’ll share it with you: that when it says, when the Lord says, “I will send you the Spirit who will lead you to all things,” that word is the future of one moment. It’s a specific type of future [tense] in Greek. It’s not that the Holy Spirit will be leading us to new doctrines; he will lead us one time. So the Church received the fullness of the faith at Pentecost. It took us time to articulate some of these things, and we see this in the early Church. For example, we see the Christians accused of believing in two gods: Jesus Christ and the Father. And the Christians said, “No, we don’t believe in two gods. We believe in one God.” They said, “Jesus is God, yes. The Father is God, yes.” “Well, you believe in two gods.” And they said, “No.” They couldn’t articulate why, but they knew what was right and they knew what was wrong. Mr. Allen: Interesting. We’ll come back to the development of doctrine in a bit. You know, we hear, and most professing Christians believe, that the holy Scriptures are “inspired.” How does the Orthodox Church understand divine inspiration? Was it considered something that came down direct from God without human filters, like the Koran is supposed to have done, or was it received through fallible human beings, etc., etc.? Dr. Constantinou: Inspiration. I know you want to talk about inerrancy, too. We’ll have to address that also. The point is that inspiration is understood in the Church as a kind of enlightenment of the individual. The Holy Spirit enlightens their mind. So it’s not that it was filtered. It’s that the expression of the truths which are in the Scriptures, the human author was enlightened toward an understanding and toward an expression of those truths. Is that what you’re asking? Mr. Allen: It is, and I want to put off Bible inerrancy and verbal plenary inspiration of the original manuscripts for a little bit later, because we’re going to want to discuss that. Mr. Allen: That’s what I was getting at. Dr. Constantinou: ...word-for-word what was to be written. Now, there were some early Christian writers like Origen who really believed it was a very mechanical thing: the Holy Spirit dictated word-for-word. Most of the Fathers didn’t seem to express it that way. Instead, they recognized that there’s a human component in the Scriptures. So the Holy Spirit enlightens the human author, but they never lose consciousness. They’re not possessed by the Spirit. They’re not like a conduit for the Spirit. They retain all of their human concepts. They remain part of their culture. They retain a lot of their ideas, but their thinking is enlightened by the Spirit. There is a synergy. There is a cooperation between God the Holy Spirit and the human author, who expresses it in their own particular way, and they have to do that, because they’re speaking, first of all, to the people of their times. If they don’t maintain their own identity as a person of their age, then how can they possibly convey that to the audience that they’re trying to reach? Mr. Allen: And I ask the question, obviously, because for many of our listeners and for many of us who came out of Evangelical and Protestant traditions, their only source of authority is the Bible. Knowing, believing, trying to understand upon what basis there is this transcendent authority of these translations is of prime importance, [whereas] we understand that our tradition includes the Bible. Am I right on that? Dr. Constantinou: In terms authority, are we talking about? The Church, when we talk about tradition, I think that a lot of people think that it’s something like, “Well, that’s what we’ve always done, and that’s why we do it.” But holy Tradition, apostolic Tradition, is not like that. It’s not like having candles on a birthday cake and it doesn’t have a real meaning and it doesn’t really count for anything. What we have is: Holy Tradition is what the Church was taught by Christ and the apostles, in continuation. The Bible is part of that, but the Bible does not contain everything that Christ said and did. Mr. Allen: That’s important to bring out, because we’ll often get Protestants, Evangelicals, they’ll say, “Where do you have Divine Liturgy in the Bible? Where do you have this and you have that?” The Scriptures are not necessarily meant to include every [thing]. It’s not an encyclopedia of Church tradition. Dr. Constantinou: It’s not exhaustive of everything that Christ said and did. You look at the beginning of Acts when it tells us that the Lord was on earth after the Resurrection for forty days, and he spent that time teaching the disciples. What was he teaching them for forty days? He was teaching them things; some of the things were never written down. If you think about the fact that the Lord had a ministry that lasted for three years, and every day he did something and said something amazing, extraordinary—we don’t have three years of narrative in the gospels. We just have a tiny fraction. Mr. Allen: I’m speaking with Dr. Jeannie Constantinou. Our call-in number is 1-855-AF-RADIO, 1-855-237-2346. Phone lines are open, and we’re going to just take a short break and come back. We’ll be talking more about the Eastern Orthodox approach to the Bible, and I’ll want to get a little bit more from Jeannie about the authority of Scripture as it relates to the authority of the religious community and its tradition. We’ll be back just in a couple of minutes. Stay with us. Dr. Constantinou: You know, I’m glad he brought that up. Thanks for asking the question, Chris, because you sort of asked that, Kevin, and I never got around to answering it, so it’s a really great question. Like you mentioned, the question about the virgin birth and things like this. Here’s what happened. This is something difficult for people to understand. I know that I did say that the Hebrew text was not standardized; there was no uniform Hebrew text. But it goes beyond that. The Hebrew alphabet does not have any vowels in it, so if you were to read, imagine the English alphabet without vowels. Let’s take an ordinary word, like the word “word.” If it were to be written in Hebrew, it would be w-r-d. Now, when you read that, is it “word” or is it “ward, w-a-r-d”? It could be “weird, w-e-i-r-d.” It could be “award.” It could be “wired.” Any combination of vowels could find into those consonants. That’s what the Hebrew looks like. In the Masoretic text, what the Masoretes did during the Middle Ages was try to prevent anyone from having alternative interpretations about what the word meant. They created little dots and dashes to tell you how to pronounce it, effectively fixing or standardizing the text. When they did that, they definitely standardized it in such a way that they would try to minimize Christian claims, but even without those vowel pronunciations, we have variations among the consonants in the Hebrew text. There’s no question that after the Church was up and running, the Christian realities, the Christian claims caused the Jews to try to translate and standardize the text in such a way that it minimized Christian claims about Christ. We never got back to the virgin and “almah,” but maybe we’ll take the caller first. Mr. Allen: We will. We do have a caller. I just want to ask one quick follow-up. Are you saying that they, the Masoretes, tried to change the text in order to minimize the impact of the Old Testament, or was it more to clarify the translations, or…? Dr. Constantinou: Well, it’s not a translation. The Masoretic text is when they took and added dots and dashes above and below the Hebrew letters to specify what word they thought it should be. The Masoretic text is the basis for all the English translations, or most of them, in the English-Bible world. I understand Chris’s confusion at what can be trusted, because there have always been variations. Here’s the thing: We never depend on one verse in the Bible for any doctrines or any of our teachings or beliefs, so there have always been variations, because the Bible has always been hand-copied until about 500 years ago, when we have standardization. People didn’t get hung up on the fact that there are differences from here and there, so it’s okay. Go ahead and read the Bible. It doesn’t matter if the Septuagint is a little bit different [from] the Hebrew. Mr. Allen: It might be a problem for people, though, for whom sola Scriptura is their only source of authority. We’ll get back to that. Dr. Constantinou: That is true. That’s right. That’s why sola Scriptura is problematic, among other reasons. Mr. Allen: Bingo. But I’m, of course, biased. Mr. Allen: We have a call from Marsha from Lincoln, Nebraska. Marsha, are you on? Mr. Allen: Welcome. What’s your question? Marsha: I have a question. Have you read the book, The Evolution of Adam by Peter Enns? Are you familiar with that book? Dr. Constantinou: I am not, Marsha. Hi, Marsha! Thanks for calling in. Marsha: Hi. I was hoping you’d read it, because then I wouldn’t have to try to explain it. I wanted your reaction to the book. I am only partway through it, but he talks about the Book of Genesis, and his idea is that—and first of all, he’s not Orthodox; he’s Evangelical, I believe—the Book of Genesis was written at the time of the, I believe, the Babylonian exile, and that it was not directly written by Moses, that they drew on oral traditions from Moses, but it was not actually written down until the time of the exile. That just kind of is a very unusual idea, and I just wondered what you thought of that or your reaction to that theory. Dr. Constantinou: Thank you, Marsha. That is not a new thing. There are many people, scholars, who are saying that parts of Genesis… The prevailing theory in biblical studies today, for the Torah or Pentateuch, is that it was a combination of different authors that were put together. It’s extraordinarily difficult to date these things, and different scholars have different opinions, but really, frankly, again, it wouldn’t matter. Does it matter if Moses wrote the whole thing from beginning to end? Is it not Scripture if Moses didn’t write it? Here, again, it has to do with how we view Scripture. What is Scripture for Orthodox Christians? It’s not Scripture because Moses wrote it. It’s Scripture because the worshiping community, the Jews, recognized it as Scripture. And then for the Christians: we recognize it as Scripture. That’s what makes it Scripture. Ultimately, these kinds of questions about authorship and whatnot… Genesis is inspired. You read it, and it’s just obvious. Don’t you think so? Where it talks about the creation accounts. Marsha: It’s amazing, yeah. The whole book is inspiring. Dr. Constantinou: Yes, it is. It’s inspired, whether or not Moses wrote it from beginning to end. I happen to think that Moses did write at least parts of it, but later on, if other authors added to it, that doesn’t lessen its inspirational quality. Mr. Allen: Thanks, Marsha. We’re going to need to run. Thanks. It was a great question. Appreciate it. Mr. Allen: I think we have a call or a voice mail on a similar subject. Let’s go ahead and play that one, if we could, producers. Mr. Allen: Hi, Presvytera. I’m Kimberly, and I’m from Texas. Yours is the first program that I listened to on Ancient Faith Radio in February 2010. Two years later, I am finally caught up, so I’m glad to get the chance to ask you a question now. My question is about the exodus. I’ve been hearing the experts say the exodus ever happening is speculative at best. Archaeological evidence shows a Canaanite rather than Egyptian heritage. If this were true, it would undermine a key part of Jewish identity, and the exodus is featured in so many of our hymns. As an expert I respect, what are your thoughts on this? Do you agree? If they’re right, what does that mean for us? Thanks. Dr. Constantinou: Hi, Kimberly. Thanks for asking the question [and] for being a listener [of] Search the Scriptures. I think I understand your question, although I’m not sure about the way you phrased it. Yes, there are many people who doubt the existence of an exodus, and they say, “There was this God, Yah”—sort of like Yahweh—“and the Canaanite people just made up this story of exodus, and they became, basically, the Hebrew people.” I think that’s a lot of nonsense, to tell you the truth. You see, the exodus story is so ancient in the Hebrew tradition, it’s so formative in the Jewish mind and tradition, I just find it impossible to believe that the whole thing was fabricated. Orthodox Christians understand tradition and the power of tradition and the power of the story. I really don’t believe that they would have invented, whole cloth, this idea that they were slaves in Egypt, and then somehow they got liberated. I don’t buy that, personally, at all. Mr. Allen: That would change things for the Jews, would it not? And it would certainly change things for us. Dr. Constantinou: Most of the Bible would be a lie. Even Abraham is told, when God makes a covenant with him, that his descendents will be slaves in Egypt. So much [as] she said, the Jewish identity, but also our Paschal transformation. Jesus, obviously, didn’t believe that the exodus never happened. He refers to it, so I just don’t believe that. Mr. Allen: St. John Chrysostom speaks of the reliability of Moses and so on. Mr. Allen: We have a call from Delbert from Grady, Alabama. Delbert, are you on the line? Delbert: I am on the line. Mr. Allen: Yes, sir. What’s your question for Dr. Jeannie Constantinou? Delbert: Two questions ago was about Scripture, and you were discussing and downplaying sola Scriptura and how problematic it was, but the way Jeannie wound up her presentation was to say, basically, the text was unreliable and it didn’t matter. Now, that’s what somebody non-Orthodox, listening to what she had to say, heard. Mr. Allen: Well, I’m not so sure that that’s what they heard. I think she was speaking of that—I’m going to let her speak in a minute, of course—in the context of Tradition versus text, but, Jeannie, please respond to that. Dr. Constantinou: Yes. Hi, Delbert. Dr. Constantinou: I’m sure, especially since I just responded to the last call about exodus, that I don’t believe people that say it’s not historical. I certainly believe that it’s reliable and that it matters, and I can’t remember exactly. Kevin, can you remember exactly what context did… How did you get that impression? Delbert: What you were talking about was the documentary hypothesis. Dr. Constantinou: Oh, I see. Okay. The documentary hypothesis. Delbert: And the various classes or categories of New Testament documents. And that there were differences. You were arguing very strongly that the text was highly unreliable. Dr. Constantinou: No. Are you talking about the textual transmission, the manuscript transcript transmission? The New Testament exists in about 10,000 manuscript copies, or actually the Bible, in manuscript copies, and no two are exactly alike, because when human beings copied these books, they definitely made little changes here and there. Most of them are very minor, and they don’t really affect the meaning of the text at all. I’ll give you an example. In the story of the multiplication of the loaves, where they bring [Jesus] the loaves and the fishes, Mark says, “And Jesus commanded that they all be seated,” but other manuscripts say, “And Jesus commanded them to sit down.” Well, that’s not exactly the same. That’s considered a variation. So there were differences in the manuscript copies, but they don’t affect, ultimately, the meaning of what happened. That’s what I’m trying to say. Delbert: Excuse me. You’re also dealing with the various schools or groups of texts—the Alexandrian, the Caesarian, the Byzantine, the Western—and those are different, and I understand that. My real question was, in listening to you, you were coming across in a very cavalier manner about the quality of the text, and that really—and I am non-Orthodox, by the way—was more of [the idea that] the text is widely varied, you can’t go back and say any particular document is the text—and with that I will agree—but there was this either underlying or overarching—something like that—that gave flavor to: but it really doesn’t matter; what matters is whether or not we believe it. Well, that’s highly subjective, and I can believe that I’m a toad, but that doesn’t make me one. Mr. Allen: Delbert, the difference is that we have holy Tradition and that you don’t necessarily. So you’re more dependent upon Scriptural transmission than we may be. Dr. Constantinou: The problem there, Delbert, is that you recognize then there are different manuscript traditions. There are variations within the text. That’s a reality. It didn’t bother the early Christians. It didn’t make the Bible less believable to them. They didn’t consider it less inspired, either. Delbert: Wait a minute. Right. I just realized something. We’re talking cross purposes. It just dawned on me. How can I say this? Mr. Allen: I don’t know, but make it quick, because we’ve got to move on. Delbert: Yeah, I know, and I’m going to hurry. Quite often what folks will do is they will take their favorite translation, and folks who believe in King James only are really bad about this. They will find this particular translation and know that this is the way that Paul wrote it. Standing joke among a lot of folks, but anyway: this is the way that Paul wrote it, and they are just absolutely convinced of that, and if you start to introduce to them another translation of the text, they will get highly, highly insecure. Dr. Constantinou: ...or translation, so that if that is disturbed then everything falls apart. We have so many attestations, for example, for the resurrection of the Christ, and so many stories; so many stories of Christ teaching. So we see a consistency there. The other thing we must recognize is that all translations are imperfect, King James included. There is no such thing as a perfect translation, and we have to recognize that. Mr. Allen: Delbert, I’m going to let you go because we need to move on, but please continue to listen, because we’re going to be talking about textual criticism and Bart Ehrman and some of these questions a little later on. Thanks for the call. Delbert: I understand. Thank you. Bye-bye. Mr. Allen: Jeannie, let me just follow back up. How is authority of Scripture related to the religious community and its tradition, and how, in your opinion, does Tradition help guard against the conflicting interpretations found among so many Protestant traditions? Dr. Constantinou: That’s a very good question, especially after Delbert’s question. There is no question that the Bible is authority, so if I gave the impression that the Bible is not authority in the Church, that’s certainly not true. It is authority, but it’s not over the Church, it’s not under the Church, it’s part of the Church. It does stand as part of the Tradition, part of apostolic Tradition. It’s just the written form of apostolic Tradition. To that extent, it’s not exclusive authority. Then the other thing we have to recognize is that, because there were so many heresies, people can take that written text and do what they want with it. They can interpret it any way they want, and that’s why we have the introduction of heresies. Your question, remind me again? Mr. Allen: My question was: How does the authority of Scripture relate to the authority of the religious community, and how does Tradition help guard against conflicting traditions? Interpretations, rather. Dr. Constantinou: How does Tradition help guard against conflicting interpretations? Because we don’t have only the Scriptures, we have also a sense within the Church, what we call the unwritten, oral tradition, the holy Tradition, is how the Church has always understood these verses, what do they mean. So it has to do with [the fact that] there is a kind of a guard within the Church of tradition, because there’s a kind of consistency with how the Church has always understood the Scriptures, so that when something heretical is said, we know that it is not correct, because that’s not how the Church has understood these Scriptures. So there is something to the context, and I can understand why Protestants are not comfortable with that; I really do, because for us we have this consistency through the centuries, because we read the early Church Fathers who comment on these, who use these verses, because we have them in our hymns and in our prayers, we understood what is meant by them, so they are less susceptible to being distorted by the individual opinions of people. We have a consensus of meaning within the Church, and we do not exceed that boundary. We don’t substitute our own personal opinion. Because we have this sense that the whole Church is involved in preserving the understanding of the text, we are less threatened with distortions and heresies, which, unfortunately, are really common in the sola Scriptura crowd, because then it leaves to me to decide what I think it means, and I’d think differently [from] you and the next person. Mr. Allen: I’ve often heard it said—or not often heard it, but one historian by the name of Dalyrmple once said that you could find 99% of the New Testament in the Church writings of the early Church Fathers of the first three or four centuries. So even if you lost all of the manuscripts, we would still have had 99% of it in the Church Fathers. Dr. Constantinou: Yes. Not in the right order, necessarily, but they’d be there. So because the Church [has had] a consistency in how it has understood the Scriptures, even when, as I said, there was a time in the early Church when the early Christians could not easily articulate doctrine, nonetheless, they knew what was true and what was false when they heard it, and they fought against heresies, even before there were these Ecumenical Councils. Mr. Allen: I’ve got a call from Argen from San Diego. Let’s take that one now, if we could, producers. Argen, are you on the line? Argen: I am, Kevin. Thank you. Mr. Allen: You’re welcome. What’s your question for Dr. Constantinou? Argen: Hi, Presvytera. Just a quick question about the relationship, maybe, between biblical literalism and Orthodoxy, and maybe you can provide the rest of us listeners with an understanding of patristic understanding of what the Fathers meant by a literal approach to the Bible, what literalism means in terms of studying the Scriptures, searching the Scriptures, as it were? Thank you. Mr. Allen: Great, Argen. We’ll let you go, and you can listen on the radio if you would, because we’ve got some other calls coming in. Thanks for the question. Dr. Jeannie. Argen: Perfect. Thank you, Kevin and Presvytera. Dr. Constantinou: Hi, Argen. Thank you for calling in with that question. This is a difficult question to answer, because it’s hard for people to understand what the Fathers mean by literalism, but it’s a great question, and people often ask the question, especially in areas of Genesis. For example, in Genesis we have two creation accounts: in Genesis chapter one and Genesis chapter two. Many people know that the Fathers said that these stories must be understood literally, so we do have some Orthodox Christians that basically treat the stories like fundamentalists, or they feel like they need to almost reconcile science with Genesis. But they also were sophisticated enough thinkers to know that the stories are not a description of what happened. They’re pointing to greater truths behind what happened, so you have them saying, “It’s absolutely true; this really happened,” and yet they will say at the same time, “But be careful. We have to understand that when Genesis said God took a walk in the garden, he’s not really walking in the garden, because God doesn’t go for walks.” So we know that they were aware of this, and they didn’t understand the word “literal” the way we tend to use it. What they meant by that it is that it is true. God really did make the world. Thank you, Argen. Mr. Allen: Thank you for clarifying that, too, Dr. Jeannie Constantinou. By the way, our number is 1-855-AF-RADIO, 1-855-237-2346. Jeannie, you know, oftentimes people think that, as I mentioned, Scripture just kind of fell from the heavens and showed up in the bookstores. We know that that’s not true in fact. When and where was there an official agreement by the Christian Church of the first millennium, the first thousand years, as to which books were authoritative and could thus be read in churches, i.e., the canon? Dr. Constantinou: I love that word, “official.” Sometimes I get emails: “What’s the official Orthodox teaching?” We have almost nothing that’s “official.” It is not a part of our tradition to have a lot of statements and official statements and definitions and things like this, except, of course, the canons of the Church and the Ecumenical Councils and things like this. How did the Bible come into existence? Basically, the Church inherited the Septuagint, the wider Jewish canon, because that’s what most Jews were using, so most of the early Christians were also Jews, Greek-speaking Jews, and they had a larger canon of [the] Old Testament, so that really wasn’t debated very much. Then you have the New Testament. When those books were first written, in the first century, those books were not immediately considered Scripture. We know this for a fact, because they’re not referred to as Scripture in the second century. (That’s the 100s.) Around the year 200 we see for the first time references to Old Testament and New Testament, and this is how we know that Christians had reached the idea of a canon of Scripture, a group of books that are Christian Scripture, but they didn’t necessarily agree on what those should be. So you have the gospels, the epistles of Paul, Revelation, 1 Peter, 1 John, and Acts; and those formed a core canon that very few people disputed. But then it took time for the rest of the canon to fall into place, and it was really done over a period of time by consensus. This is a remarkable thing. It’s the Holy Spirit at work in the Church. That’s one of the things that I find so amazing about the formation of the canon. Some people say it was decided at Nicaea. Absolutely not. Nicaea did not discuss the canon. They were too busy discussing Arianism. Some people say Constantine decided. Absolutely not. He did not decide, because even the canon was only becoming an issue at that time. Some people point to 367, the letter of St. Athanasius, and said, “That’s it. He settled the canon.” Well, that’s the first time that any individual listed the same books we ended up with, but he’s not the one who settled it. He makes his letter and says, “These are the books I think belong in the New Testament,” because it was still being debated. The debate continued, and people wrote different lists that we call canons. Over time, a kind of consensus grew so that we ended up with the 27 books that we have. By around the year 400, we pretty much have our canon, except for Revelation, which by that time had fallen out of favor in the East. In the East for the most part it’s a 26-book canon. The West accepted Revelation without any problem. When is it official? There is no such thing as official. The Catholic Church fixed the canon at the Council of Trent—that’s their official canon—in response to the Protestant Reformation. The Orthodox Church never officially created a canon at any Ecumenical Council, and that’s the highest authority for us. Mr. Allen: Not Chalcedon or some place like that? Dr. Constantinou: Nope. Absolutely not. Some people have said that at the Sixth Ecumenical Council, they created the canon. What the Sixth Council did is that they affirmed all of the canons that previously were in existence, but those don’t agree. You have some 26-books… Think about it. You have Chrysostom who has 22 books in the New Testament. You have Gregory the Theologian who has 26. You have Basil the Great who has 27. Even the people who were the bishops of Constantinople, these luminaries of the Church, they did not even agree on which books formed the New Testament, because every book was separate. We didn’t have the Bible in one volume. Dr. Constantinou: That didn’t happen until the printing press. Technically speaking, for the Orthodox, our canon has never been officially settled, but it came about in the way we do everything: by consensus over time. The Holy Spirit leads us to an understanding, and the Church is in unanimity. Mr. Allen: That is going to surprise some listeners. There is no question about that, because I’ve heard more definitive and different explanations with regard to Chalcedon and so on. Dr. Constantinou: No, definitely not Chalcedon. And we have the acts of Chalcedon, so we know. Mr. Allen: Yeah, okay. Well, we’re going to take a break, our second break, and when we come back, I’m going to take a call from Jacob from Dyer, Indiana, who is going to ask a question very relevant to this conversation we’ve just had in just a minute or two, so stay with us. We’ll be right back. Mr. Allen: Welcome back to Ancient Faith Today. As the announcer mentioned, our call-in numbers are 1-855-AF-RADIO, 1-855-237-2346. We’re having a fascinating conversation with Dr. Jeannie Constantinou on all things biblical. I’ve got a call which we’ll take from Jacob from Dyer, Indiana. Jacob, are you on the line? Jacob: Yes. Hi, Kevin. Thanks for having me. Mr. Allen: Pleasure. What’s your question for Dr. Jeannie Constantinou, please? Jacob: Well, my question was [with] a certain part of the Bible I have a very hard time understanding, which is the Book of Revelation, and the other apocalyptic books of the Bible, such as the chapter in Daniel which is apocalyptic and the other apocalyptic parts of the Bible. I was wondering how do you really understand the symbolic language in a way that you don’t get confused and make it—how do I say this?—understand it in the wrong way? How do you understand the apocalyptic writings in the right way? Mr. Allen: Thanks, Jacob. I’ll let you go because we’ve got calls coming and we want to free up the line, but Dr. Jeannie will answer that question now. Thanks again for the call. Jacob: Bye, and thank you. Dr. Constantinou: Thanks for the question, Jacob. Yes, the Book of Revelation and these apocalyptic passages are particularly difficult because the language is heavily symbolic. How do we regard that? How do you not fall into some kind of a heresy or have a problem with the interpretation? I think you have to take, like we have with many parts of the Bible which are difficult to understand; there are many places that the Bible is hard to understand. What we do is we understand what we can, and then the rest we have to think about or we have to study for. Really, the Book of Revelation is extremely difficult. Don’t be bothered by the fact that you can’t understand it. This is a really specialized area especially. We understand, for example, there are parts of Revelation that are very understandable, for example, the letters to the seven churches. We understand the main thrust of Revelation, that we’re supposed to be faithful, even in persecution; that there is evil; that evil attacks the Church. I don’t think you should get too bogged down in the symbols and just try to understand the meaning; also, the last couple of chapters that talk about the heavenly city. Look for the general message and don’t worry too much about the symbols. Mr. Allen: Good answer. That helps me, too. I think sort of in the previous caller we had, Delbert, kind of in his craw was this idea—and I don’t mean to be speaking for you, Delbert, if you’re listening, but it strikes me that—for Evangelicals and Protestants, the sole foundation of their faith life is Scripture. Tradition is just a different thing altogether. History is an entirely different thing altogether. One hears the term “Bible inerrancy” used to represent the view that the Bible is accurate and totally free from error of any kind. My first question is: Does the Orthodox Church teach Bible inerrancy, that the Bible is accurate, infallibly and totally free from error of any kind? Then I’ll ask you a little more about verbal and plenary inspiration. Bible inerrancy is my question. Dr. Constantinou: Yes, Bible inerrancy. Thanks, Kevin. First of all, the early Church always understood the book, the Bible, to be inerrant. The Fathers of the Church speak about it as inerrant, so it definitely [is] the understanding of the Church, because it’s inspired. The question is: What do you consider to be an error? This really is the question, because if you’re trying to compare the Bible and measure it against science, then that’s a problem. Not that the Bible has errors, but [we must consider] what was the purpose of the Bible? Mr. Allen: It means something different. Dr. Constantinou: Yes, we have to understand always, first of all, what is the purpose for which the biblical author wrote? Was he trying to teach us science or history or something like this, psychology? Or was he teaching us something about God? We have to always look at two important things. First is purpose; second is context. We would definitely affirm the inerrancy of the Bible, but that has to do with how you, again, understand it. Mr. Allen: For an example, there’s this phrase, the “verbal plenary inspiration” of the original manuscripts, and what they mean by that, from what I’ve been able to gather is that God inspired the complete texts of the Bible, from Genesis to Revelation, including both historical and doctrinal details. The word “verbal” affirms the idea that the inspiration extends to the very words the writers chose, and thus the Holy Spirit guided the writers along while allowing their own personalities and freedom to produce the Bible as we have it today. Would we disagree with that? Dr. Constantinou: I don’t think so, because definitely everything is inspired, but we have to remember that the author is writing as a human being of his time, expressing the things according to the language of his own time and place and his culture. That doesn’t mean that it’s in error, because we discover that the world is millions of years old, not 5,000 years old. That doesn’t mean he is in error. The question is: What is he trying to teach us? What are you considering errant or inerrant? What are you considering to be the truth? Dr. Constantinou: What are you considering to be the truths of the Bible? We have to recognize something else, and I cannot let the program go without making this point. Scripture—this is the Fathers of the Church—is God’s condescension to human beings. We have to always remember that all human language is inadequate to talk about God. All language. Chrysostom talks about this a lot in Genesis, and yet we want to talk about God. We want to know God, and God allows himself to be described even in ways that aren’t appropriate for God. Is it an error to say that God walked in the garden? It’s not an error; it’s human language. If you want to say, “Well, God doesn’t have feet; therefore that’s an error,” then we’re distorting, really, the purpose and meaning of the text. All human language is inadequate, and Chrysostom says—we think we’re so intelligent; we’re so sophisticated—the Bible is like a baby’s babble to God. He allows us to talk about him in ways that are really inadequate and sometimes even unacceptable to describe God, and yet we have to talk about God. We have to always understand the limitations of human language. Mr. Allen: I think that really does play into this issue of biblical inerrancy, so thank you for clarifying that. I have a question from Marlene from Pittsburgh who doesn’t want to go on air, but she wants me to ask you this question. Marlene, thank you; I think it’s a good question, and here it is. She wants to know what it means that Jesus is the Word and the Bible is the Word of God. Dr. Constantinou: That’s beautiful. Hi, Marlene. Thanks for asking the question: How is Jesus the Word and the Bible the Word? Well, Jesus is the Word because he was revealed to us as the Word, the Logos in the Gospel of John, of course, in the prologue of the Gospel of John. I think it was a beautiful expression on the part of John to say that. At the time, “logos” or “word” was also used in Greek philosophy to express the principle which governs all of creation, that which is behind creation, that which holds all things together. This was an insight on the part of St. John to call Jesus the Word. He is also hinting at the fact that he was the one who created the world, so when we talk about creation I know sometimes Westerners think about God the Father, but it’s really the Son who was active in the Old Testament. Dr. Constantinou: He is the Word of God. He’s also the Word of God because he reveals God the Father to us because he was incarnate. So there are many ways in which Jesus is the Word. Mr. Allen: Compare this with the Bible is the Word of God, I think is her question as well. Dr. Constantinou: The Bible is the Word of God because the message is from God, but the ultimate Word of God is Jesus Christ, because he is the ultimate revelation of God. As we said, human language has its limitations to describe or explain God, but Christ was unlimited. The apostles experienced God in the Person of Jesus. What they experienced went beyond human language. Mr. Allen: I know Protestants listening will want to know the answer to this question, and I’ve had this asked as well, and that is: Do Orthodox Christians regard the Scriptures, the Bible as we have it today, either in Septuagint or the New Testament, as the sole and final authority in all matters of faith and practice? I’m thinking with regard to Tradition and the Councils, how do we square this with Protestant traditions, for whom there is no capital-T Tradition? Dr. Constantinou: Obviously, it can’t be the sole and final authority, because the Bible doesn’t interpret itself. It’s just impossible. The Bible is a written word, and it requires human interpretation. Whenever we read it, whether we’re trying to or not, we’re interpreting it. People go sometimes to Bible studies, and they say, “Oh, there’s no interpretation, there’s no doctrine. This is just exactly what it says.” Well, that’s absolutely impossible. There has to be some consensus about what it means, and in the Orthodox Church we have maintained that consistency of understanding, that consistency of interpretation. We have as authority the Bible, absolutely, because it’s part of the Church Tradition, but we also have holy Tradition, we also have the Councils of the Church. Just to give you an example, we have in the Scriptures the words, “This is my Body; this is my Blood.” Well, what does that mean? Is it really the Body and Blood of Christ? Mr. Allen: We’ve got a lot of differences of opinion on that. Dr. Constantinou: Exactly. If the Bible is the only authority that’s necessary, it’s not doing a very good job because it’s not explaining itself. That’s why there has to be something outside of the Bible, and for us, it’s that connection to the early Church. When we look at what Christ said about his Body and Blood in John 6, or we look at what St. Paul said about it in 1 Corinthians 11, it’s clear what was meant by that, but it’s also not just the Bible in one portion, but the totality of the Scripture witness that’s important. Mr. Allen: Thank you. I have an Evangelical Pastor Lyle from Rhode Island holding. Can we get Pastor Lyle on? Mr. Allen: Good evening, Pastor. What’s your question? Pastor Lyle: Long-time listener. I guess an encouragement and a question. One is, yeah, I’m a long-time student of the Fathers and really appreciated so much and would disagree with very little of the things that have been said. I just wanted to say I think there’s a higher percentage at least of seminary-trained Evangelicals who are much more on the same page than is sometimes projected as it relates to understanding holy Tradition and seeing that as a huge component. Just the fact that Wheaton College started an early Church/early Christian studies, you have so much going on in that world. University Press is publishing the Fathers in terms of commentaries, and I think there’s so much more going on. My question, I guess, would be from the standpoint of seeing the limitations of sola Scriptura, and there’s a humility that comes along with that in terms of how we understand the Scriptures. On the other side of the ledger of the holy Tradition, sometimes I feel like Orthodoxy creates a picture that that holy Tradition has great unanimity and completeness, when in reality there’s a lot of other differences and wars that have gone on within that element as well. I just wanted to know if you were going to address that. Does that make sense? Mr. Allen: It does. It’s actually a great comment-question, because you’ve got issues like: We had a show last week, Pastor, on universalism, and we’ve got St. Gregory of Nyssa and others that are firm proponents of universalism, but yet the Church condemned it and we didn’t excommunicate St. Gregory of Nyssa, so your point’s very well taken. Thanks; we’ll let you go. Jeannie will answer it. Appreciate your question and appreciate your listenership. Dr. Constantinou: Thank you, Pastor Lyle. I want to say, first of all, you’re absolutely right that there’s a growing interest in the Fathers of the Church among a lot of Evangelical Protestants, and they’re doing wonderful work in the studies of the Fathers and publishing translations. You’re absolutely right, because I think they have [begun] to realize the limitations of the sola Scriptura. They want to be clued-in, tied in to the ancient Church from what I understood. I see what you’re saying, that Orthodoxy creates this idea of Tradition that may suggest a kind of perfection even within that… Go ahead. Mr. Allen: Let me just jump in here and say I think we converts particularly are prone to making Tradition more uniform and more… well, I think uniform is the word I’m pointing at, because I think he’s exactly right. When you first come in you want everything about Orthodoxy to be perfect, because you were concerned about what came before, and in sola Scriptura and in various interpretations and heresies. You come in and it takes a while to figure out, as he points out, that we don’t have perfect unanimity even within holy Tradition. Dr. Constantinou: That’s right, but we do have unanimity in doctrine and dogma. So there are sometimes little variations in opinion, and we definitely see that. The Fathers of the Church had different opinions about various Bible passages. We don’t have uniformity in that sense, but when it comes to who Christ is, the virgin birth, the Resurrection, these key things that used to hold all Christians together, that all Christians believe today is up for grabs, we definitely have a uniformity there, and we do not see variations among the Fathers of the Church in terms of dogma. They may have opinions about different little minor things, and some of them may disagree, but not in dogma. Mr. Allen: And what is that word, theologimena? Mr. Allen: Theologoumena, theological opinion. Dr. Constantinou: Opinion of one Father or a small group of them. There is a kind of consensus of the Fathers that keeps us going, and we recognize it and we experience it in the Church. Thanks, Lyle. Mr. Allen: Thank you. Yeah, that was a great question. Thanks, Pastor. We’re starting to descend. We have about 20-ish more minutes, and I’ve got a lot to cover, so let’s carry on. Dr. Constantinou: Let’s try to be fast. Mr. Allen: No, you’re doing great. I appreciate it. It’s hard. These are hard questions, and a lot of ground to cover. Let’s talk about interpreting the Bible: hermeneutics, as it’s called in the Orthodox Church. You talk about three levels of interpretation in your new book which I am going to purchase immediately, because it’s just a world of important information. I [skimmed] it when you were resting before the show. You talk about the literal typology and moral or figurative. Am I safe in saying there’s not one predominant hermeneutical or interpretive way Orthodox Christians interpret the Bible? Would that be fair? Dr. Constantinou: Yes. I think that’s a great question, Kevin. It does speak to a lot of the things that we’ve been talking about. People have called in, uncertain about how to understand the Bible. It’s not [I] who said that there are three levels of interpretation. This is the standard patristic explanation. What they meant is this, and I really want to encourage people to read the Bible even when they feel like they don’t understand everything. There are three levels. That means the lowest was the literal or the historical. That is the historical event: what actually happened. We can understand most Bible stories right on that basic level. For children, that’s pretty much the level. Then you have the moral level, and that is: what moral lesson can we draw out of it. Then you have the highest level, which is the spiritual level, that is, what does it tell us about doctrine, dogma, Christ, things like this. Some Fathers had four levels, but the point is the Bible can be understood on different levels appropriate to each individual person. The Bible is written in such a way, Chrysostom and all the Fathers say, that everyone can get something out of it. The parts that you don’t understand, you just go on to something else. Mr. Allen: Interesting. I read a great book—actually, not read. It’s going to take ten years to get through it all, because it’s so deep. It’s Genesis, Creation, and Early Man by Fr. Seraphim Rose, published by St. Herman Press. They wrote in the book St. John Chrysostom (and I’m quoting) stated that “the events recorded in Scripture must be understood to have actually happened although they might be also given a spiritual or typographical meaning,” which is exactly to your point. We get so many questions about: “Do I have to take Genesis as earth science literally?” and so on, and this really speaks to that issue. Dr. Constantinou: No, because the Fathers weren’t stupid. I mean, they could see that while they want to insist on the truth of Genesis, it doesn’t have to be a description of what happened in order to be true, because all language is inadequate to talk about God. We have to find language that tells us something about God, but it really can’t describe God. Mr. Allen: And you mentioned—I want to get this point across, if I may—they also mention in this particular book the holy Fathers tell us specifically the one thing not to take in the literal way is the anthropomorphic statements about God, that you mentioned, about God walking as a man. They tell you: that, do not take literally. Dr. Constantinou: Yes, that’s true. That’s very true, because some people actually used to in the early Church, so we had that problem. There were some monks who took many things, including Revelation, very, very literally. That became a problem. What you’re pointing at, Kevin, is something else. I talked about the three different levels of interpretation and understanding, but within that, we also have to understand that language functioned [in] the Bible, the way language does for every language today, some things are intended to be symbolic, like in Revelation. Some things are metaphor; some things are hyperbole. So when the Lord says, “If your right hand offends you, cut it off,” he’s using hyperbole; he’s not telling you to cut off your hand. We have to understand and use discernment in understanding what is meant by the words. That’s not easy to do, so people who are experts don’t agree on these things, and if you’re an ordinary Christian, do the best you can. Certainly Chrysostom says we attract the grace of the Spirit when we read the Bible. We shouldn’t be too puffed up, too arrogant that we understand everything, but we shouldn’t be [disheartened] if we don’t. Mr. Allen: I think it speaks to why I, for an example—it doesn’t speak to why I, but it speaks to the issue of having Blessed Theophylact as an interpretive aide, or St. John Chrysostom’s Commentaries as an aid, so that you can get the opinion of Church Fathers who are a lot holier than we are and a lot closer to the time of our Lord and so on. Dr. Constantinou: ...couple hours. That’s for sure. Mr. Allen: Answer this one fairly briefly if you don’t mind. There have been questions even in ancient times, Dr. Jeannie Constantinou, about authorship of some of the key books of the New Testament, whether they were actually written by whom they said they were. You spoke a little bit about that in the beginning, about Moses and Genesis. Does Orthodoxy in general take a conservative view of the authorship of Old and New Testament books, that is, they were definitely written by St. Paul, etc., or does it allow for other possibilities of authorship? I’m speaking about books like 2 Peter, [2 Jude], [3 John], the Book of Revelation, and maybe to a lesser degree, Hebrews and James? Dr. Constantinou: Yes, okay. Definitely we take a conservative stance. We take the traditional stance. There’s no question about that, and yet we do have some fantastic scholars in the Bible. We have fantastic Old Testament scholars who are very familiar with the different theories of authorship. I think what we have to recognize is that there were traditional authors for these books. The Torah is something special that’s so long ago. Let’s just talk about the New Testament and leave the Old Testament out of this. Definitely we believe that the people who are the named authors are the actual authors, but if someone should hold a different opinion, because there were disagreements in the early Church and maybe this is what Pastor Lyle was sort of hinting at: We talk about Tradition, and yet not everyone agreed, for example, that Paul wrote Hebrews. That comes to be sort of the standard explanation in the Church, but most Fathers did not believe that Paul wrote Hebrews. Nonetheless, it has been accepted as Scripture. Why? Not because we decided that Paul wrote it, even though that’s what the Church has sort of as the official author, but because we recognize the inspiration in the book. So while authorship is something we talk about, I don’t think it’s important that we get hung up on that, because what is important is that the Church recognized the inspiration of the book, not that it was written by a specific person. That’s not what makes it Scripture. It’s the Holy Spirit’s inspiration of that author, so even though Hebrews is technically anonymous, there’s no question that it’s inspired, so that’s what the Church confirms, ultimately. Mr. Allen: Good answer. Great answer. Thanks. That really helps a lot. I have two final questions from a friend of mine who is vacationing on her fortieth wedding anniversary. Her name is Judy. She’s from California. They’re in Kona, Hawaii. Judy and Ron, I hope you’re having a great time. Here’s a live shout-out for you. You’re an inspiration to me, both your marriage and both of you. Here [are] her questions, and they’re great questions. Although Orthodox Liturgy is full of Scripture, both in word chant and hymnology, the reading and studying of Scripture does not appear to be as important to the Orthodox believer as it is to the Evangelical, of which she was one. Why do you think that is, or does this just appear to be the case? I know you’re an honest person, so give me the honest answer. Dr. Constantinou: Okay, Judy. Thanks for the question. Congratulations. And since you gave a shout-out to them, I have to give a shout-out to my husband. How are you up there in Québec, honey, agape mou? I love you. So here’s the answer to the question. The Liturgy absolutely is full of Scripture. Why doesn’t it seem more important to Orthodox Christians? Judy, you’re absolutely right. It isn’t, and to the Evangelicals coming into the Orthodox Church, they’re practically scandalized by that. There are two answers for that. First of all, in the Protestant it was the sola Scriptura. It was a liturgy of the Word. You came to church and studied the Bible, and the pastor preached for an hour, and that was the focus. For us, the focus is not on the word of God as the Scriptures; it’s the Word of God; Christ. What we receive in the Divine Liturgy is Christ himself, the eternal Word of God, the Logos of God in the flesh. So this is why: our focus is different, because we have a relationship with God that is intimate, not through a page but through actual spiritual union, for the physical and spiritual union with him. But there’s something else that I want you to know about it, and I do want to take time to address this. When the Reformation was happening, Western Europe was really booming in terms of education and universities and the printing press. At that time, in the East, we had a tremendous decline. The East had gone into the Dark Ages. Greece was under Ottoman Turkish rule for four hundred years. During that period of time in many places it was forbidden to teach children Greek, and children went to school secretly at night. Many people could not read. Of course, Greece was not liberated until, really, the majority of Greece, until after World War I.
We’re playing catch-up right now. We’re far behind the West in terms of Bible knowledge because our people were literally uneducated, including many of the priests. Priests knew the services by heart. They weren’t even able to read the Bible in some cases. We are really behind the curve, but I am hopeful that people like you [who] have come into the Church will bring with you your love—and I see that happening—your love for the Scriptures and an enthusiasm that will infuse that in the Orthodox Church, because it is our tradition to read the Bible and hold it in high esteem, and that’s been our tradition since day one, because that was what the early Church did. As a former Evangelical Protestant, I not only studied the Scriptures but read them devotionally, often applied specific verses to specific needs in my life. This brought me great comfort and hope. This doesn’t seem to be an approach to Scripture that Orthodox embrace. Is that true, and how would you define Orthodoxy’s recommended approach to personal Bible reading and study? I’m always talking about Greece, but the Middle East, all of the Slavic countries, Russia was Communist, and even before it was Communist you had people who were living in such poverty they weren’t reading the Bible but they knew their faith. They went to church. Their lives revolved around the Church, the cycle of the Church year. They knew the saints. Every village had a saint. They had the icons which were another form of the Word of God in picture. Even though if they didn’t sit down and read the Bible…They may not have owned a Bible. They may not have been able to read. Yet we should not think that these people were less devout as Christians or less knowledgeable about Christ, because they went to Church, they heard the readings, and they paid attention in church. They weren’t hearing them in Greek in Russia; they were hearing them in Slavonic. While the West had the Scriptures in Latin, and people came to church and didn’t understand it, that was never the case in the East. When people went to church, they heard the Bible and they understood it, and this is how they got their Bible education. Mr. Allen: This has been fascinating. This has been a great, great evening. Thank you so much, Jeannie. I really appreciate it, Dr. Jeannie Constantinou. By the way, her new book is titled Guiding to a Blessed End: Andrew of Caesarea and His Apocalypse Commentary in the Ancient Church. Again, it’s by Eugenia S. Constantinou, and it is published by the Catholic University of America Press. If you go up on Amazon and type “Eugenia Constantinou,” it’ll pop right up for you. Dr. Constantinou: Just “Constantinou” is enough! Mr. Allen: It’ll come right up, and I mention that because there are people on the website, or on the chatroom, rather, that really wanted me to mention the book so they can get it. Dr. Constantinou: Oh, that’s so nice. Thank you so much. Mr. Allen: Thank you so much for joining me tonight. Dr. Constantinou: It’s been a pleasure, Kevin. My greetings to everybody out there in podcast-land. Thank you for listening to Kevin’s program, for listening tonight, and for listening to Search the Scriptures. Thank you so much. Mr. Allen: Before we sign off tonight, the winner of our Legacy Icon of St. Seraphim of Sarov is Marsha from Lincoln, Nebraska. Mr. Allen: Marsha, congratulations, and enjoy that icon. That’s my patron saint, so I’m jealous. Join me on March 10. Our topic will be human exceptionalism and its threat by the animal rights and nature movement. That is the premise of one of my guests, Wesley Smith, who is an advocate of human exceptionalism. He will be joined by Fr. Christopher, who is a well-known animal and dog expert at New Skete. So we’re going to have a very interesting and balanced conversation about how we view animals and nature and whether they’re persons, as some of the newer people allege. I’ve also got a specific comment from the head of PETA about this interview, which you’ll want to hear. I’m going to challenge Wesley on that. You can leave us a pre-recorded question for my guests about this topic. Google Ancient Faith Today; you’ll see how you can leave a recorded message. Many thanks to our production crew this evening: our engineer, John; the programs producer, Bobby; our call screener, Troy; our chatroom moderator, Fr. John; and, as always, my loyal production assistant, Jennifer. Please tune in next week at the same time for Orthodoxy Live with Fr. Evan Armatas. Thanks for listening. God bless. Have a great week.